Puddleglum is C.S. Lewis’ Eyeore. I’m trying hard to see beauty in the world today, but my heart is heavy and my mind finds it all rather futile. Fall is my favorite season, yet so far all I see is death and destruction… and the stubborn will of some to keep going despite the odds, to find beauty, to bloom where they are planted and to do so in adverse conditions. Keep championing the cause for the downtrodden. Give hope to those who have no hope. The one who receives your encouragement might be struggling more than you know. Even Eyeore and Puddleglum need a pep talk now and then. Wait, no — that’s not right. I’ve gotten to visit the next generation family twice over a 4-day window. I visited on a Saturday nearly 2 weeks ago . While The Scout and SuperDad were off Riding the Hiawatha, I had the privilege of riding with my little buddy. It had been 6 weeks since my last visit and I felt about three weeks overdue for grandson snuggles. I cannot get enough of this sweet boy. SuperDad hadn’t seen him in person since Mother’s Day, so the two of us drove to their town again last Wednesday. I love seeing my husband being a grandpa. Listening to Daddy’s voice coming out of the tube at the park… It’s so fun to see Little Foot clearly working his brain to figure out his world. We were chillin’ at the park (literally, we were keeping cool at the end of a hot day). The Author, who loves all birds and had at one time wanted to become a veterinarian specializing in bird care, enjoys feeding the ducks. And then she caught one! Little Foot was curious at first but then became jealous of the creature in Mommy’s arms where he rightfully belonged. It was clearly bedtime for baby. Little Foot is 7 months old today. Time is passing by so quickly and his babyhood is already slipping away. His mama sent me this picture just a few days ago — Standing! Wait, did I use the word LESSON? Ah… this was the school year of taking an online Spanish course. The Scout struggled through this course, not really understanding much of anything. He’s our last kid and we are pretty hands-off at this point because he has been so responsible. What we didn’t know was that this was a “homegrown” course for the school district and by the end of the year, a majority of the students had dropped it, were failing it or in danger of failing it. We turned to a neighbor for help — he had taught high school Spanish before he retired — but even he couldn’t understand what the English directions were asking the students to do. With the neighbor’s help, The Scout took a “pass” on the course, scraping by with a D-. Now he is trying to catch up with students who took Spanish 1 in the classroom by taking a 6-week remedial course online for summer school. Unfortunately, this course began one day before said teenager left for a week of scout camp and will end with another week of scout camp , leaving him 4 weeks to do the work. There’s a strong chance he may end up repeating the course in a classroom in September. So that’s painful lesson #2. The Scout went off to Rendezvous with minimal supplies. Many items were strictly forbidden due to the fact that they hadn’t yet been invented and/or in use during fur trapping 1830 North America. 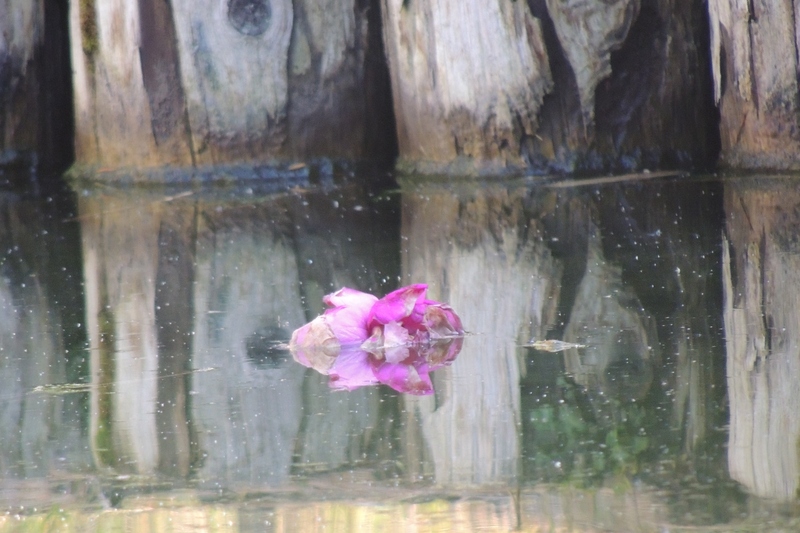 The boys waded to an island with their burlap sacks, built and slept in tepees, kept mosquitoes away with smoke, swam with beavers, and generally did things that mothers shouldn’t know about. It’s the sort of week where scout safety is quietly set aside for realism. I’m pretty sure the district office allows this to operate on a don’t ask/don’t tell policy. Our young man learned some useful skills and had a wonderful time. After picking him up on Saturday, we drove home with the windows open. It wasn’t all mud and beaver dams and mosquitoes; they also did sewing and bead work, shot with black powder, and learned a lot of history. I have discovered something about myself over the past 30 years, that when the truly frightening events occur — when the kid falls 2+ stories and lands on his back, when that same kid chokes and has to be thoroughly suctioned when he’s 6 hours old, when another kid totals the car, or I hit a deer at 50 mph –all those times and more, I enter a state of calm that is almost frightening in itself. It may appear that I am lackadaisical or don’t have a true understanding of the situation. It’s quite the opposite; I understand all too well. There are things about which I simply cannot write. Things like possums that curl up and die in a hidden corner of the garage/bonus room. It’s been nearly 9 years now since that incident and my boys know that just saying the word “possum” still gives me the heebie-jeebies. There are other things about which I have written only in passing — upchucked chipmunk heads, for example — because I am thoroughly squeamish about such things. (I avoided both the cat and the front porch for many days after that incident.) When my husband was deployed, I relied on neighbors to rescue me from the horrors of decaying creatures and dead birds in the fish pond. When faced with a mouse in my suitcase, I locked myself and my baby in the bathroom (oblivious to the fact that there was a one-inch space between the floor and the bottom of the door). Becky over at Noodleroux is much better about injecting humor into the situation. Go read this post and you’ll see why she’s my new hero. Tonight I came home from work to a new catalog on the kitchen counter. 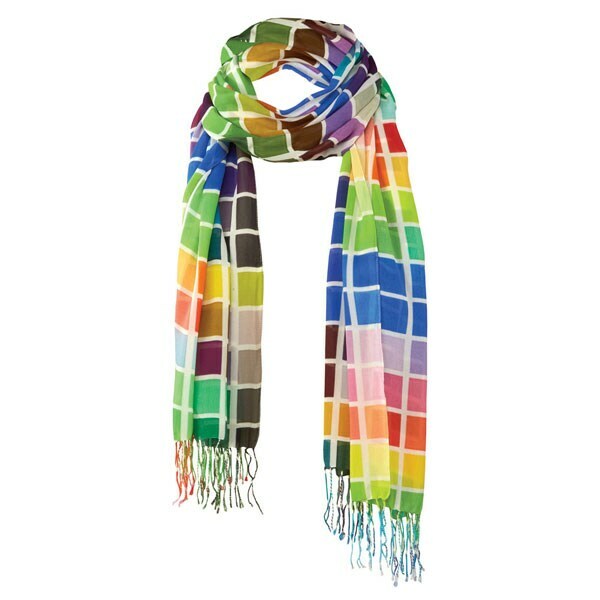 The scarf on the cover made me think of Jen on the Edge with its ROY G BIV colorblock design, so I opened it up and perused the contents (the catalog, not the scarf). Sterling silver 1 1/4″ twist-top pendant holds a small quantity of cremated ashes (or dried flowers, or a lock of hair). 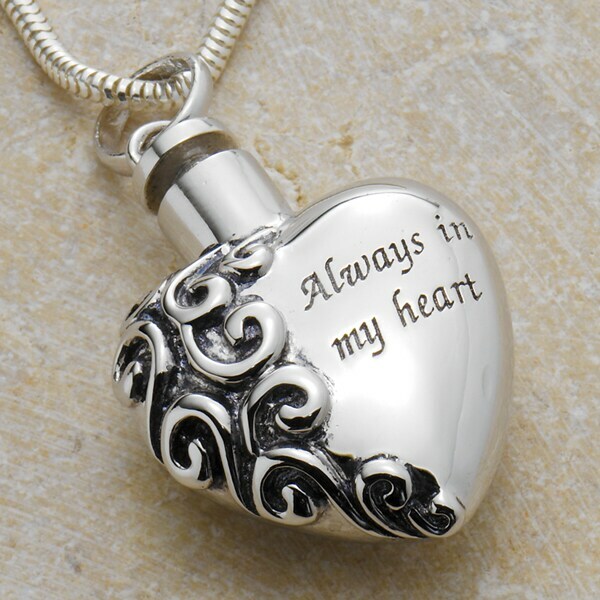 The front is engraved with “Always in my heart.” Arrives with a funnel spoon and message card printed with inspirational verses from Scripture. 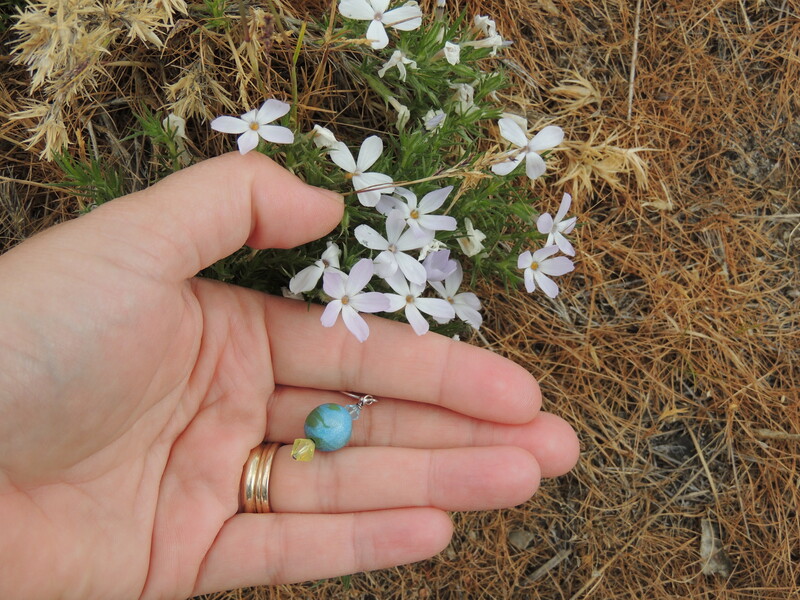 I’m curious… would you wear a pendant with a loved-one’s ashes? Gunshots can’t be heard from 300 miles away, but the reverberations of the shootings of 6 young people at a high school not far from my hometown are felt in my heart. The shooter was not bullied and he was close friends with his victims. One of those victims is the daughter/niece/cousin of 3 of my former classmates. Yes, it hit close to home. This could have been my own son’s high school. It could have been any school. It could have been your own kids or grandkids, nieces or nephews. And things like this keep happening all over the country. What has happened to us as a society, that such tragedies are almost commonplace in recent years? 1) When we were kids, cartoon violence was obviously not real (think Road Runner, Bugs Bunny, Tom & Jerry). Now, kids are growing up playing video games that MAKE violence occur — from obvious cartoon violence like Mario’s SuperSmashBros. to computer generated, quasi-realistic situations where gamers play at war. Instead of watching things occur and laughing at them, computer games INVOLVE the player and make them PART of the violence… with no consequences. I’m not saying that people can’t tell the difference between reality and the game; I’m pointing out that we “play” at violence as a society, as well as watch it in movies and on television. It becomes something we DO on a regular basis. Welcome to the United States the NRA hath wrought. Put a gun in EVERY hand, and everyone will be safer. Well, do YOU feel safe? These are NOT criminals or gang bangers. They’re your neighbors and classmates. The equation “anger + gun” NEVER works out to our benefit. My libertarian friends believe that everyone would be safer with a gun to protect themselves and their families against “the bad guys.” What they don’t seem to understand is that it doesn’t have to be a “bad guy” — anyone can become a killer in an angry moment if there is a gun available. You never know what button, pushed, will send ANYONE postal. The important thing is that there not be a deadly weapon right there at hand when he goes off. ESPECIALLY not one that would allow him to kill multiple people in a short period of time – even at a considerable distance. There’s no way an innocent victim can defend him or herself from a bullet, no matter what silliness you see in the movies. And I, for one, am tired of crying over senseless deaths of young people. Right now there is an impressive storm rolling through the area, with thunder, lightening, wind, and rain. I haven’t seen a storm like this since our camping escapade on Assateague Island. The storm, however, is merely a way to segue into what is on my mind tonight.. 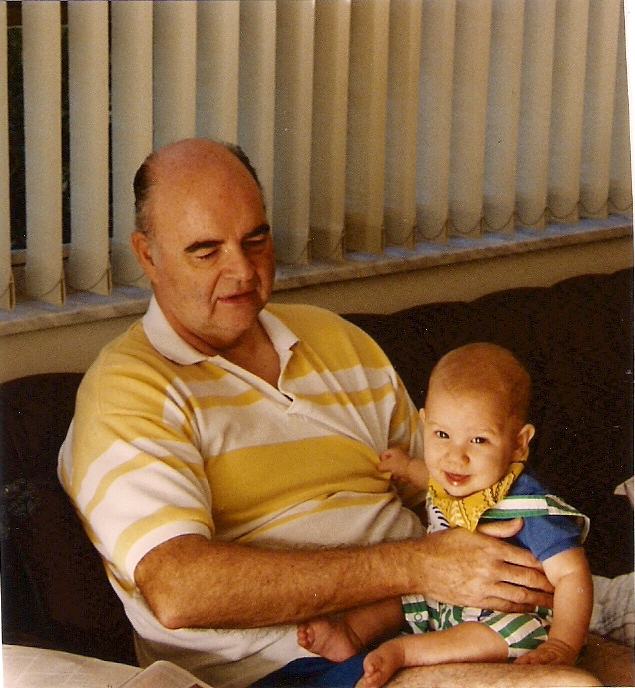 This is my oldest son with my dad for whom he was named. It was taken nearly 22 years ago, before my dad was ever diagnosed with Parkinson’s Disease… before he had any symptoms of it at all. When he retired ten years ago, he and his wife chose to move from Florida and settle in Arizona. No one else in the family lives there. (We didn’t live in Florida, either; that is simply where his last job was located.) I took the kids to visit them in 2003, about 6 weeks after they settled into their new home. Good thing, too, because they only lived there for 2 years before his health required moving into a retirement center — and soon after that he began spending time in nursing care facilities. I talked to my dad on the phone on Friday. His voice was weak and he was having more trouble than usual with his words. I didn’t think too much of it because that wasn’t the first time I’d had a frustrating “conversation” with him in the past few years. However, this evening I received my weekly update from his assisted living facility, and I didn’t have to read between the lines on that e-mail to know that he’s been going downhill. I’ve already made my travel reservations to go see him in the first part of November. In fact, I did that about 2 weeks ago after reading between the lines on previous updates. Each of my brothers will be there in October for a few days. I’d rather time it to be there with at least one of them, but I had to work around family schedule here along with my own work schedule. I’m grateful that I have a job that allows me to pay for such a trip. Not a week goes by now that I don’t fervently wish my dad had considered living closer to family in his old age. Had they chosen to live within a day’s drive of many of us, we could visit more often and more easily; his wife would have been able to see her adult kids more often, too. 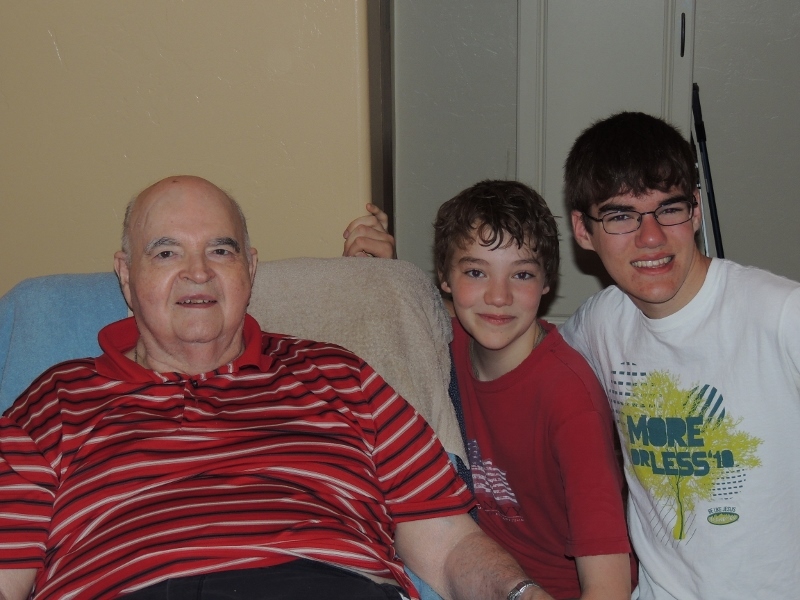 When we visited in April of 2012, Grandpa could still walk down the hallway with a walker and a “spotter” (responsible adult), although that was difficult for him — mostly he got around in his wheelchair. 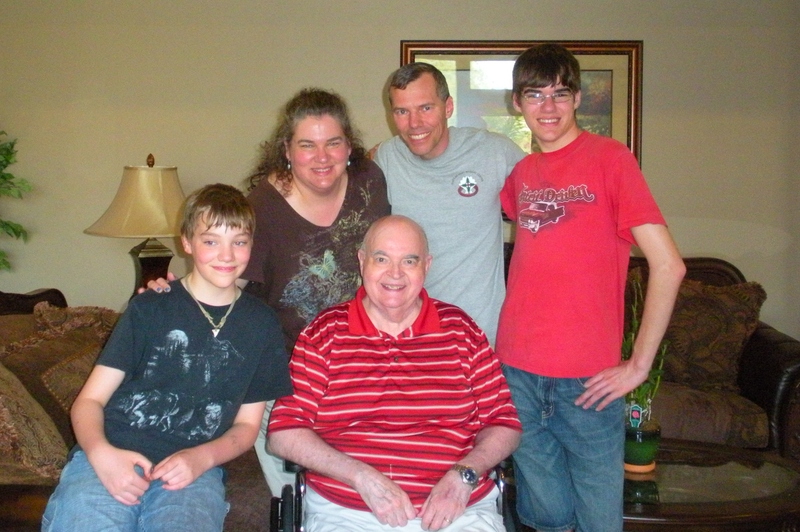 When we visited him one year later, he was only using his walker to steady himself when transferring from the wheelchair to his special recliner or another position (bed, toilet, etc.). Now, just 4 months later, he is needing multiple people to assist him in those transfers because he doesn’t have the strength to help… but he is still trying to do things on his own. Several falls have not stopped him from trying to do it himself. I really can’t tell if he is being stubborn in giving up his independence (hello? He’s been in an Assisted Living facility for the past several years) or if he is forgetting that he can’t do it himself. There is some dementia that comes with Parkinson’s Disease. I suspect there is also despair that comes with losing the ability to care for oneself. Time Warp Tuesday is the brainchild of Jenn who juggles TWT along with the rest of her life. Click here to see the other participants and their photos. When I was 29 months 7 months pregnant with our second child, we had an uncharacteristic heat wave that made staying home unbearable. Sitting around in our underwear helped but we didn’t want to scare our kid, the neighbors or the mailman. Luckily, it was the start of a weekend-in-the-middle-of-the-week (hospital employees often don’t have normal weekends) and SuperDad whisked us away to the coast. Three hours in the car made a huge difference as we watched the degrees plummet on our digital thermometer. The Washington coast on the Olympic peninsula was much cooler. In fact, it was a little bit cold there — we had to put a sweatshirt on MM, who had a great time playing on the beach and in the car. The respite from the heat was such a big treat that I still have fond memories of the trip even with the small matter of the skunk that tried to sleep with us that night. 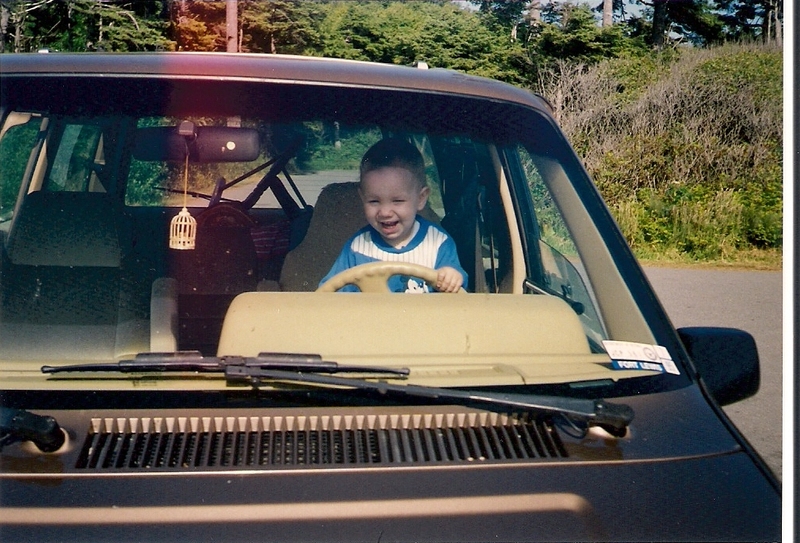 Less than 18 years later, my happy-go-lucky boy was a little too confident with his own driving on a dark and rainy night. In what I see as miraculous each time I look at the photos (go here if you really want to see them) , he walked away with only scratches after totaling a car. Not everyone is that lucky. I got a call on Sunday morning, letting me know that the MIL and FIL of one of my closest friends had been in a fatal car accident. My dear friend ~P~ has been through some terrible experiences in her life; losing her dear parents-in-law ranks up there among the worst of those experiences. I am under a heavy cloud of sadness. I can’t begin to understand why some people go through admittedly unfair amounts of suffering. Since I know there are no answers to that question, I won’t beat my head against the wall in trying to understand. So here I sit, nearly 3,000 miles away, helpless to do anything. And remembering that life is precious. 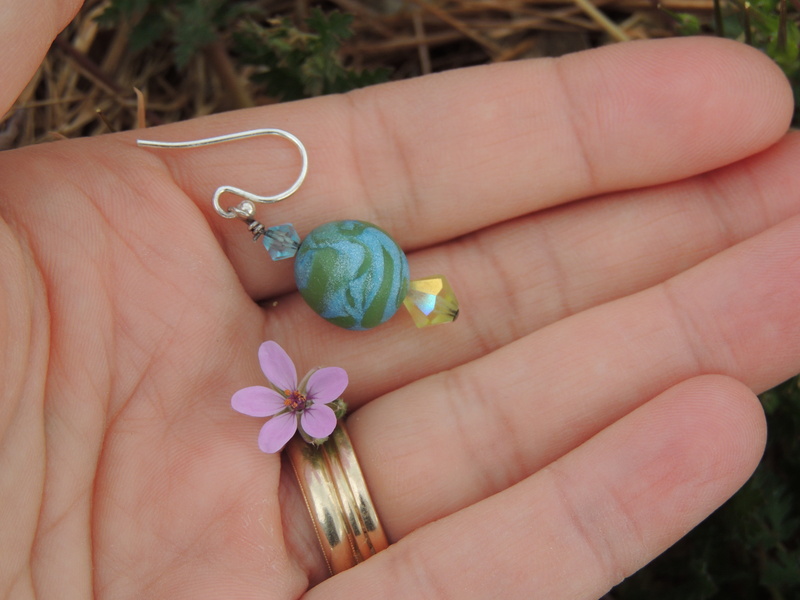 I went back to the park yesterday to take a few more pictures showing the comparative size of the wildflowers (same earrings as before, made by Cassi). 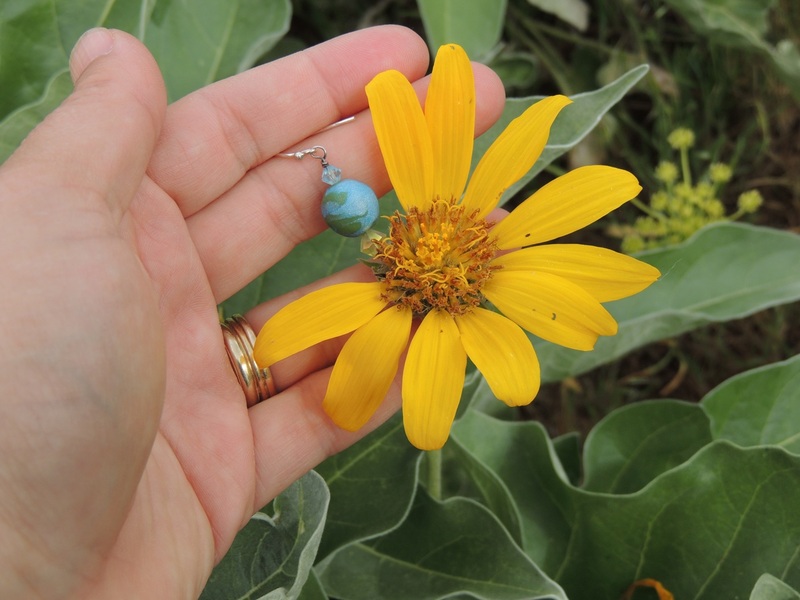 Okay, I JUST realized that this isn’t the same flower as the above pic… but the sizing *is* correct, so let’s pretend that it’s the same. Okay? Folks from several local tribes were there, with loads of gravel to spread on the paths as erosion control. 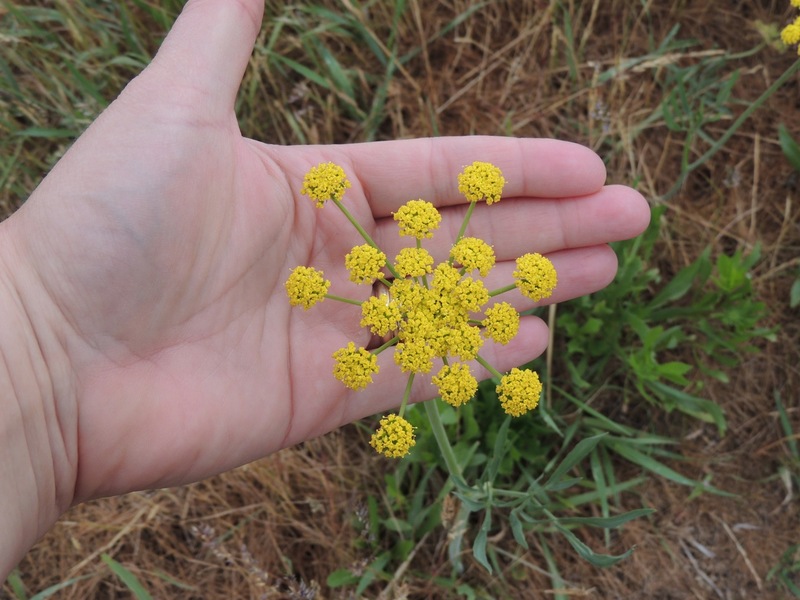 I cringed because they were driving ATVs to bring the gravel and tools to various spots… and driving over some of the wildflowers. I’m cringing again now, just thinking about the smashed flowers and grasses. I like to keep the conservation area conserved. I wish I could take a couple of road trips to meet other bloggers with whom I’ve become friends. My older teen nearly laughed himself out of his chair at the dinner table last night. Granted, I did refer to Harvard as a possible back-up school… but only because his first choice is [the much closer to home & family] Stanford. On the other hand, Stanford has only sent him a letter over the winter to suggest he spend thousands of dollars on a 3-week-long summer camp; the older, more distinguished school has sent him a letter asking him to consider applying to attend college there. This kid has a lot of decisions to make in the next few months. Tomorrow is the “Breakthrough for Brain Tumors” 5k walk. I’m walking in a group of friends and we’ll be surrounding a mutual friend’s family with love and hugs while we honor his memory. It’s going to be an emotional morning.